Ginger is a perennial plant that grows in India, China, Mexico, and several other countries. The rhizome (underground stem) is used as both a spice and in herbal medicine. In a double-blind trial, ginger powder was as effective as anti-inflammatory medication (mefenamic acid and ibuprofen) in relieving symptoms of dysmenorrhea. Ginger has antinausea properties and may prevent postoperative nausea and vomiting. Traditional Chinese Medicine has recommended ginger for over 2,500 years. 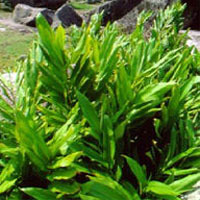 It is used for abdominal bloating, coughing, vomiting, diarrhea, and rheumatism. Ginger is commonly used in the Ayurvedic and Tibb systems of medicine for the treatment of inflammatory joint diseases, such as arthritis and rheumatism.